The initial project goal was to build stunning footage for the Radisson Hotel. It will be built near Disneyland in Anaheim. The animation’s main purpose was to impress future investors. They wanted the animation to encourage full project funding. The approximate cost for construction weighed in at $25 Million. We were the main 3D studio subcontractor for this project. This project was under a large-scale budget. Because of the costs, the company who hired the animation was under high-stress stakes to get perfect renders. This is why the architectural firm that issued the work would change details on the fly. Faraday 3D had to keep in step with their pace to deliver solid work. The primary struggle for this project was keeping up with constant structural changes and managing team of 10 3D artists. A major plus of working with large architectural firms? They come to the table with all the materials one could possibly need. They provide them in 3D format. That means you don’t have to waste time trying to understand building blueprints. Believe us - this is a great time devourer in most cases. However, the 3D prep can also bring problems. A basic rule of thumb in 3D render is this - what you don’t see on camera should not exist. 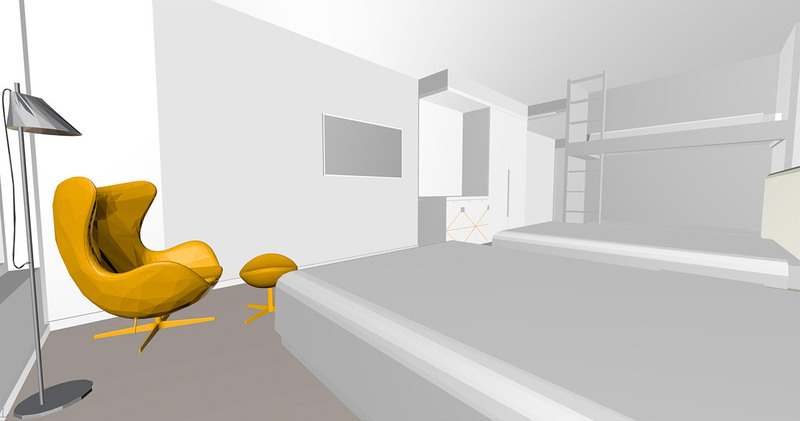 For example, in one project we were doing interior renders. We wanted the outside window to look completely photo-realistic. Usually, 3D companies will insert a real photo outside the window and leave it at that. In our case, we needed a special background. One that consisted of a forest with a mist. We did everything manually. We added the mist and needed to render several images that either included a window or did not include a window. In this scenario, even if the camera is turned away from the window, the render time is increased by a large margin. For this scenario, the time was 15 hours per render. If we were to remove the backgrounds in this scenario the render time is 2 hours. This brings us back to our architects. Sometimes, when large studios provide 3D prep materials, they put too many details in them. 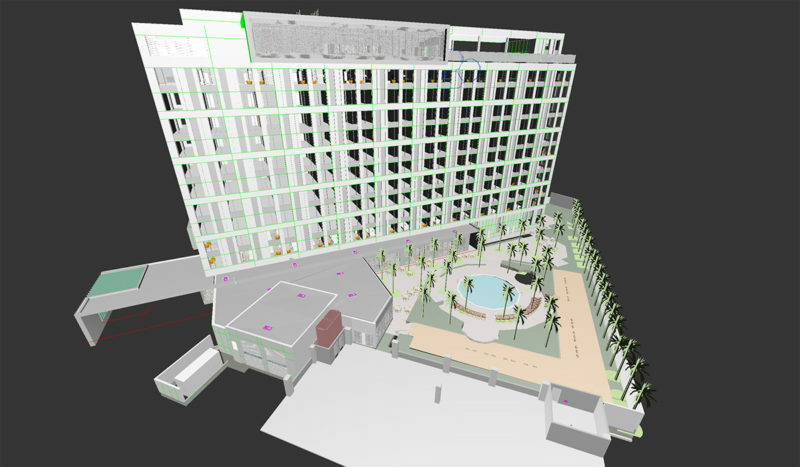 For example, say we are doing an exterior view of a hotel. If we used what the architects sent us without making modifications, then even the beds in the hotels will be shown with the nuts and bolts that are anatomically correct to their make. Yet, for exterior visualization, the beds themselves don’t need as many minor details to be usable. Too much detail is a bit excessive in our case and changes the rendering time it takes to sort through all that extra information. In our case, for initial materials to be the most viable, we have to remove any details that are not camera visible. That is still easier than modeling the building from scratch. With this project, it was obvious we would need help. Our team was under strict deadlines. Yet, we are a small studio. By ourselves, we were no match for the Radisson Hotel project. We had to reach for external help. Faraday 3D brought in 2 outside 3D teams to work under our supervision. We also added on 2 standalone freelancers. They were sourced by Faraday 3D from global locations. We distributed the work so that each party of our outsource team had one segment of the hotel to visualize. Later, Faraday 3D would need to combine the finished pieces that were the joint effort of all outsource teams. That, by itself, seems like a pretty straightforward process. We had problems along the way, and these taught us some valuable lessons. The biggest mistake we made at the beginning of the outsourcing job was a simple one. We didn’t put a great deal of thought into how we would combine the work once it was finalized. Our train of thought was compartmentalized. If one room was done by one team, and another room was done by a different team, then we could just place all the objects into one final file, right? As we approached project full-scale, we began to realize some issues with this theory. Some pieces of the process will belong to the same image at the same time. If both teams do these same pieces, in the combining process, the pieces overlap. That results in ruined animation. Additional problems cropped up during this process. We saw that static renders appeared fine at first, but then, when you applied moving animation walls and other elements would flicker. 3D Flickering from Dimitri Bobkov on Vimeo. Scene checks and combining all scenes was a much bigger task than we’d anticipated. In the next big project, we took these issues into account. Next time we distributed the tasks to the teams with more thorough description. Who would handle common stuff was predetermined and assigned to just one team. This saved us significant time when we went to put it all together at the end. A request that made the whole project a bit more challenging was animated people. They should walk, chat, and be seen doing social activities. To allow for this option, we had to use a software called Anima. The Anima software is not able to import all needed objects all at once. Such objects include roads, stairs, and the ground the people would walk on. Those things had to be taken out of the main project and imported separately. This surprise was a bit unpleasant on our part. No studio can handle animation rendering in just a few days. You’d need 1000 servers to get that workload done that quickly. Our studio is smaller and therefore a bit limited by default. We simply don’t have the budget to buy that many servers outright. They cost 5k+ USD each. Because we only have 10 servers, we needed to improvise. We chose to use the biggest yet most affordable rendering farm on the internet - Rebus-farm. They have 1,000+ servers at their disposal. This was a high-stakes venture. If team action from Rebus went badly, there would undoubtedly be a lawsuit from our client included. It would cost our reputation and millions of dollars. Or, we could have success, and come away with a piece like none we had ever created before. We chose to continue. It was the reassurance of both Anima and Rebus-farm software documentation that spurred us on. The two reportedly would clap perfectly together with no further issues, no fears. We would have our moving people included in the final render. Frustration gripped us when we submitted our animation for rendering one evening. The next morning, the moving people we’d submitted were missing from the animation. Or rather, they were ghost-like in that sometimes they would appear, and others they would flash and flicker and disappear. We could not turn in a haunted hotel to our client, and run the risk of losing everything we’d worked for. We were on the phone with Rebus-farm the same day. Had we stayed on the phone, we’d have been waiting a year for any actionable response. We got the same scripted line one would expect and they were working on the problem. Yet still, we played phone tag for two entire weeks while we searched for a replacement. At last, a godsend if ever there was. We found the Garage.farm support team at our low point. There are no words to thank them adequately. Sometimes they have the same glitch issues as Rebus-farm, but unlike the server giant, they were willing to stay on the line and walk us through our Glitch Mob catastrophe. After spending night after sleepless night of tireless work together, we were able to render our animation. Garage.farm goes down in the history of Faraday 3D’s many exploits as having the overall best support team. They even worked with Anima for us. After a grueling reconnaissance, it was found that the Anima software was losing access to the servers. Each time the software lost server access, it had to be added manually back to retain the animation. Garage.farm pulled our creation out of the proverbial fire even when Rebus.farm,the largest server conglomerate on the web, was not able to do it. We’re still waiting for our answer from them. We’ll update in a few decades when we’ve reached their verdict. Sometimes the client’s wishes overshoot the project’s budget. To be technical, we can render anything the client desires on every budget, but we can’t promise the results at lower rates. This is because rendering companies charge for time duration. The better quality video you receive, the longer it will take to render. An animation is composed of 24 still frames shown over a 1 second period. The less time spent on each image means less time to render them. There will be more “noise” in each still frame as it goes into the final animation. Next, you can see two frames - one is rendered with high-quality measures. The second is “noisier” and has fewer visible details. For the first time in this project, we approached animated fountains using 3dsmaxs particles. To clarify, this is totally new stuff for us. We had truly never tried this before. As 3D animators, particle animation was something almost completely foreign to us. For us, this was like being a dentist and being asked to treat a stomach pain. We could have used 3rd party software. Yet, we didn’t want to run the risk of adding new software bugs to our already difficult animated people render. The risk was too great so we instead learned an entirely new leg of our trade in the time it took to meet this deadline. To say we learned a lot from this project is putting it modestly. “Works on my machine” was a famous programmer’s meme we thought belonged only to them. We soon realized it applies to 3D artists too. If something works on your machine, great, but don’t expect it to work so well on the next system just on principle. If you work with different people, delegate the work at the outset. Make each step a critical calculation to avoid issues later. If you know the project’s going to be big, optimize as much as possible from the outset. Don’t procrastinate on this step. Afterward, it will be a headache because of how many objects you’ll be working with. Hardware will slow down a bit by default. Talk to your client and break each step down at the start. Don’t wait until you’re mid-crisis to let them in on the process. At some point during the process, you’re going to have to adapt a new skill. Embrace it. This is your new normal. It’s good to give your client a little heads-up about a new concept. They need to know that you are seeking the best solution to a problem that is a little new for both of you. The most important takeaway we managed from the Radisson render? Faraday 3D may be a little studio, but we are capable of great feats. Bigger than even our client’ first ambitions accounted for. Radisson Blu by Faraday 3D from Dimitri Bobkov on Vimeo.